Why the name magicians of mines? It was not at random that the factory was baptized with this name, there is a whole historical context and a mystical involved uniting the touches of the personality of its founders. The distillation process was cited by the Greeks and Romans, such as Aristotle (384-322 BC), Nicander of Colophon (183-135 BC), Pliny (the Elder, 23-79 A. C). Ambix, distillation pan and cooler described by Zosimus, from Marcelin Berthelot, Collection des anciens alchimistes Grecs (3 vol., Paris, 1887 – 1888). 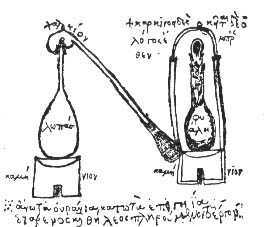 Creation of the hygrometer by measuring the specific gravity (the nodes used as Alcoholmeter) by Hypatia. It is believed that the distillation process was already known from remote times but subtly quoted, without technical details as noted in the pre-Christian works of Aristotle, due to the fact that such knowledge was protected as strategic secrecy, past Only to alumni in high studies, the penalty for disseminating such knowledge is the death. Unfortunately the pre-Christian alcohol distillation arts that were kept in the libraries of high studies of philosophy sciences were destroyed by the emperor Diocletian in 292 A.D. Who ordered to burn the books of alchemy and finally also by the Caliph Omar (Umar ibn Al-Khattab) in 642 A.D. With his arson attack on the library of Alexandria. A fact at that time would be tantamount today to the destruction of all data stored on the Internet and digital databases from all over the world-a total blackout of the Internet. It is believed that many scrolls of greater interest were plundered before destruction. Years later the Arab alchemists began to develop equipment distilling “al-Anbiq (الأنبيق)”, possibly based on the scrolls stolen from the library of Alexandria, beginning with Khalid Ibn Yazid, and these alchemists do not They saved words to describe the processes used to obtain compounds of vegetables and beverages, with emphasis on what they called “soul of the wood, soul of the flowers, soul of the plants, soul of the beverages” which was nothing more than aromatic compounds such as Essential oils loaded with esters and alcohols. The distilled beverages are known abroad as spirits-literally “ghosts”, given the origin in the alchemy of the process of removing the soul from the vegetables, from the beverages. As the alchemists in medieval times came to be called Wizards and having mines a fertile welcome of secret societies that studied the Treaties of alchemy and magic, also having inspiration in the biblical passage of the Three Wise Men, was then baptized as Mine mages. The clergyman, a member of the Ecclesiastical class who participates in the political decisions of the kingdom, represents the exchange of the Vatican with the reigns. It also participates sometimes in adventures and battles. The magician ends up being more prominent than the clergy because it is always treated as the source of science, wisdom and healing. He ends up taking part in political and martial strategies besides being responsible for developing weapons, remedies, poisons and also deep knowledge of nature, botany, alchemy and… From beyond. As they are part of the taste of the 3 forerunners of their foundation, their favorite heroes are characters always connected to the Magi (Merlin-King Arthur, Harry Potter, Gandalf-Lord of the Rings), also having the perception that making cachaça is a science that goes back to Times of the alchemists and even the biblical passage of the visit of the Three Magi (Balthazar, Baker and Gabriel) to the newly born Messiah-these elements were concatenated coming to this name. In our productive process are reguarded as the holy Days are recessed and empty moon of course. If you drink, do not drive. Forbidden for people aged less than 18 years old.